It seems appropriate that Emory Perry grew up on Music Street in Sherman. “Everybody on Music Street played an instrument,” he said. 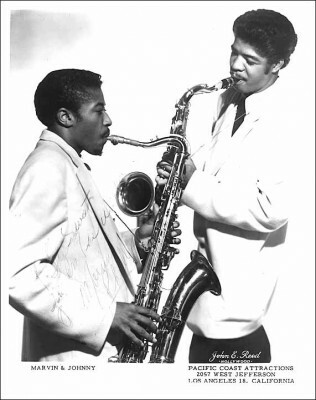 “The first thing I played was a snuff can with holes in the lid covered with tissue paper.” His mother took in extra work to make the $45 to buy him an alto saxophone, and he learned to play it under the eye of the new bandmaster at Fred Douglas School, Dr. Orpheous Anderson. By the age of 12, Perry was playing with the house bands at some of the clubs around Denison, including the hot spot, the Tropical Gardens. Perry went into the army when he finished school, and though he was assigned to an engineering unit, he quickly organized a band, and spent more time with sax and less time with the jack hammer. When he got out of the service in 1949, he wanted to study engineering, so he moved to Los Angeles to live with his sister and go to school under the GI Bill. 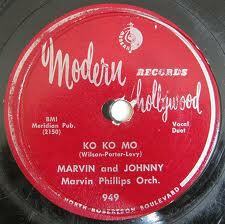 Many music scholars agree that much of the Doo-Wop sound of a few years later, grew out of the early stylings of Marvin and Johnny. 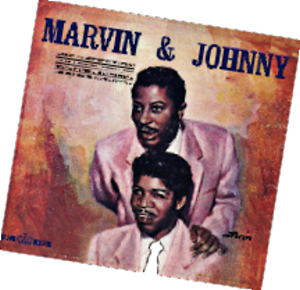 For most of the next 20 years, Marvin and Johnny were a solid act, playing packaed rooms at clubs, recording and touring the county in two Chevy Suburbans with “Marvin and Johnny” emblazoned on the sides. And then it stopped. Almost over night the gigs dried up as disco swept the country. 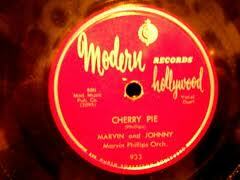 Now it was the music, not the musicians who drew the crowds, and with little expenditure, the clubs could hire a DJ and buy a batch of records and be in business. Marvin went to work for the city of Los Angeles and Emory Perry got a job at the post office. If anyone knows how to reach Mr. Perry, let us know.